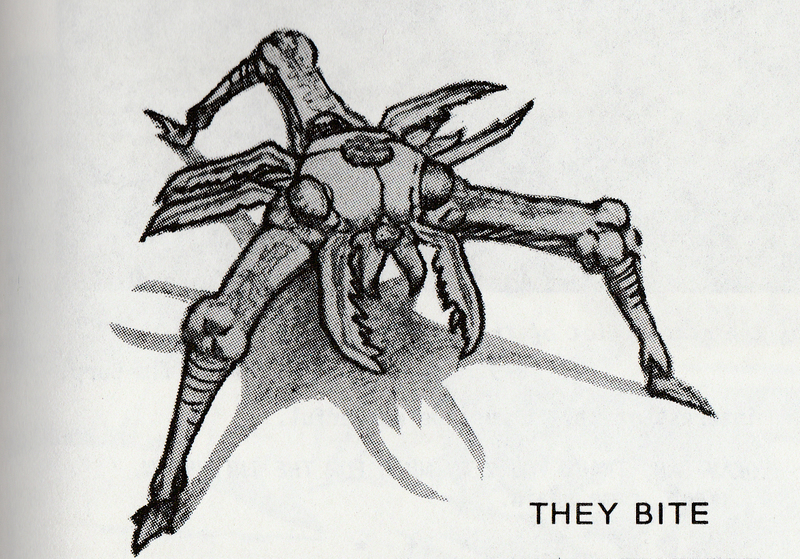 Dan O'Bannon wrote "They Bite" in 1975 the year before he wrote Alien, and indeed the script was a pre-curser to Alien, and he passed it around the studios, it was well received, but unfortunately this was in a time before Star Wars, and the studios didn't think that the special effects could be done. He was told that special effects were a lot art, but he didn't believe that because he thought that stop-motion animation would have handled the bugs in the story nicely, since they were just bugs. The jerky strobe effect of stop motion wouldn't have been so apparent. 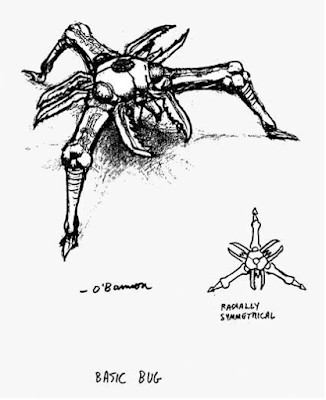 For his script, he drew an illustration of the insect shown as having three legs as if it were a miniature Martian war machine from War of The The Worlds, or perhaps it echo of the three legged 5,000,000 year old remains of Martian creatures from "Quatermass And The Pit", and the creatures from They Bite would remain hidden from man through recorded history and emerging after 65,000, 000 at a modern day archaeological dig, and this story would have included dozens of these bug like creatures running around. 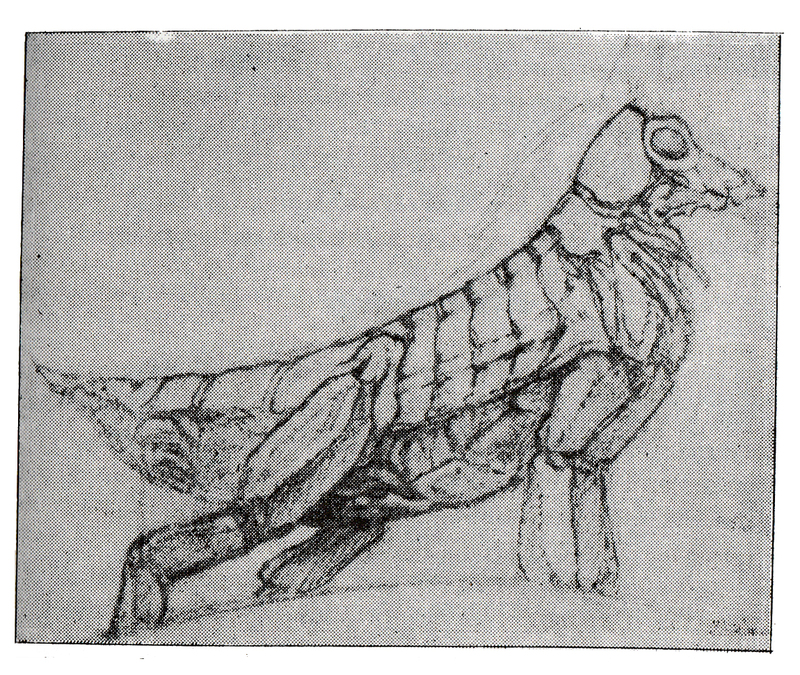 Dan had the idea that these insects devoured anything organic, such as animals, people, wood, plastic, and they would mimic the thing that they've eaten. So after the insect devoured its prey, it dissolved the prey in its highly specialised digestive juices, breaks it down to its molecular components and then copied the DNA patterns and grows a duplicate, except the duplicate is really an insect, and then the duplicate is only roughly like the creature copied in the way that one might see insects and amphibians that have evolved to look like something else but when you look at it, it only roughly resembles it. 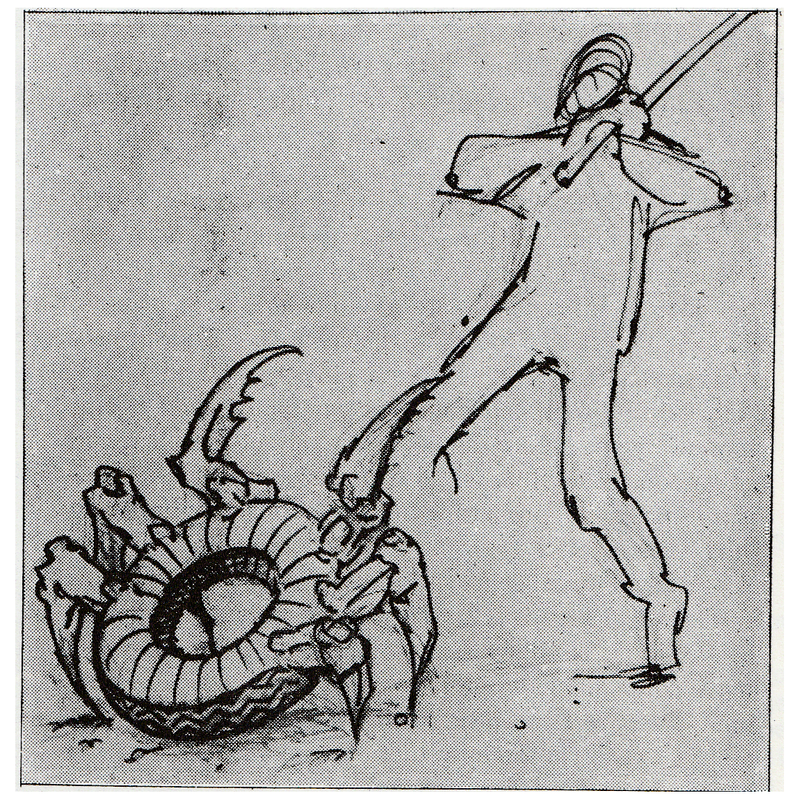 However rather than just going along with the idea that these creatures resemble what they have eaten because of the DNA patterns that have been copies, these things also can resemble objects that been eaten which changes the idea somewhat, so one of them grows to resemble a rubber tire on legs, so it does seem to go far beyond copying the DNA. Does it really copy DNA at all? 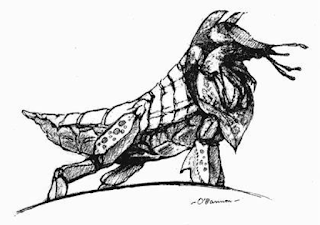 Whatever the case the new creature is the old one after it has transformed and shed it's skin. There appear to have been more than one version of the script done, evolving over time when he revisited, Dan might have been talking about a different version of the script from the one in Bleeding Edge: Dark Barriers, Dark Frontiers when talking about how Alien borrowed ideas from it. 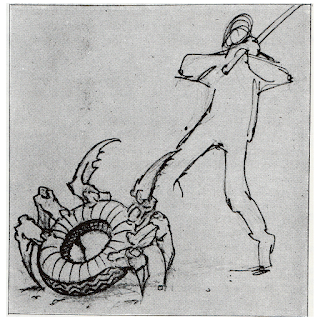 Whatever there is to be said about this method of shapeshifting, this process involves what was basically a stomach sack that might be roughly described as a cocoon and once the creature has eaten enough, then its skin would harden and a new version of the insect would crawl out although Dan talked about a cocoon that was spun. Included in the film story were two of these creatures that had eaten a collie dog and both looked slightly different ugly fiberglass versions of which ever part of the dog they had eaten. The creatures are extremely specialised but mindless creatures that simply eat and reproduce and their ability to adapt is beyond belief, they can mimic anything. 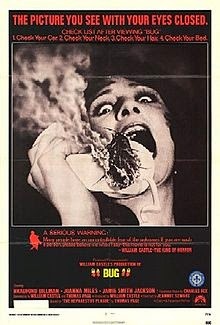 Incidentally 1975 was the year that the movie Bug was released which was about an underground form of fire starting cockroach that couldn't live in surface air pressure for very long that came to the surface when a large crack in the ground develops after an earthquake and so the main character cross breeds it with a cockroach that lived on a surface, unleashing havoc. e) Borrowing from They Bite for Alien? When Dan came to write Alien which had been coming together from lots of bits and pieces of ideas over time, he wrote it using many of the tropes and beats of They Bite, but in a setting that resembled Dark Star. It's possible that it had been renamed Drone, and so They Bite was used as a title in 1996 by another film maker and Dan hoping at some point to make the film renamed it Omnivore. What I can see though is that the insects in They Bite were polymorphic in their nature when they reproduced and an idea of about the alien would be that the creature in its next stage of its life cycle would something completely different from its previous stage to the point where it was unidentifiable. Dan mentioned that the idea of something that was basically cocooning was used in They Bite and we have that as a scene in Alien where characters are cocooned and the alien young grow into the life form that we know of as the spore which was loosely referred to as an egg. But while the insects from They Bite appeared to be lying dormant for millions of years, the facehuggers were in a way too but fully grown just waiting for something to come along that was near enough a host for to implant its seed into. There is the idea that the alien beast from Alien has alien DNA combined with human DNA and that's why it has taken a humanoid form, but I don't personally know that the idea came from They Bite, although in hindsight, it looks as if somehow it must, but it may have just been an idea that came about because they were struggling to find a poetic licence for the alien being roughly man shaped. Dan would have preferred that the alien looked less human. 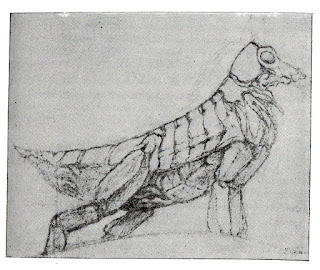 Years later, films such as the Alien 3 inspired Mimic by Guillermo del Torro would explore the idea of an insect evolving to imitate the form of a human. Mimic was based on a very short story of that name by Donald A. Wollheim. Den of Geek: Moving on to new projects, is They Bite perhaps a return to the vampiric theme of Lifeforce? Dan O'Bannon: No, it’s closer to Alien really. A few years ago I changed the title of the thing because They Bite sounds like They Live and it does suggest vampires, as you pointed out. I changed the title to Omnivore, but it doesn’t really matter; it’s not about vampires. Actually with They Bite I sort of plagiarised myself. You see, They Bite was not dissimilar to Alien except that it was set on Earth, at a present day archaeological dig, and instead of one monster there were dozens of things running around, bug-like things. I wrote it back in “75, the year before I wrote Alien, and I passed it around the studios and it was actually well-received, but this was pre-Star Wars, and the studios didn’t think the special effects could be done. I remember being told that special effects are a lost art. Well, I didn’t believe that, because I knew that stop-motion animation would have handled the bugs nicely, especially since they were bugs. The jerky strobe effect of stop-motion wouldn’t have been so apparent. So I knew they could be done but the studios didn’t think they could be done. They liked it but they passed on it because of that. So when I found myself desperately in need of a sale, I thought, well, they liked They Bite but they thought it was too expensive and didn’t know how to do the effects…if I could write something in a similar vein where it’s obvious that you can do the special effects, then maybe they’ll buy it. So I said I’ll set it on board a spaceship; then the only thing you have to build is the inside of a spaceship. And what’s the easiest way to do a monster? Man in a rubber suit - yeah? So I thought okay, I’ll have one humanoid monster. And of course it has a couple of earlier phases, but they’re small and they don’t move much. And so I wrote it, and yeah, it has a similar tone and feel. It’s not specifically the same. Den of Geek: In an way it’s like a precursor of Alien, then? I've been wondering what THEY BITE was about since reading Dan O'Bannon's letter in an early issue of STARBURST (possibly #9? Star Trek: The Motion Picture cover), in which he promised it would be a worthy follow up to ALIEN. The DNA/replication life-cycle encourages a pet theory I have of ALIEN as oblique remake of FORBIDDEN PLANET. The Space Jockey joined to the ship physically and telepathically, the ship is some kind of temple of the psyche. Maybe the eggs are part of the ship, maybe a fusion of the organic and mechanical, only, like the Krell, the space jockey race couldn't control their base instincts, and the aliens spread through their technology like a cancer. Into this wanders Kane, the ship attempts to absorb him, the chestburster truly is Kane's son in the sense that it is a melding of himself with the alien. As such the alien carries all of Kane's repressed hostilities and desires, like the Id Monster. Hence eliminating all the others and trapping Ripley alone in the shuttle, all to himself (well that's one theory). Thanks once again for your great site!